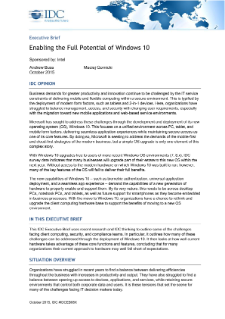 Windows® 10 for Business: Business demands for greater productivity and innovation continue to be challenged by the IT service constraints of delivering mobile and flexible computing within a secure environment. This is typified by the deployment of modern form factors, such as tablets and 2-in-1 devices. Here, organizations have struggled to balance management, access, and security with changing ...user requirements, especially with the migration toward new mobile applications and web-based service environments. Microsoft has sought to address these challenges through the development and deployment of its new operating system (OS), Windows 10. This focuses on a unified environment across PC, tablet, and mobile form factors, delivering seamless application experiences while maintaining secure access as one of its core features. By doing so, Microsoft is seeking to address the demands of the mobile-first and cloud-first strategies of the modern business, but a simple OS upgrade is only one element of this complex story. With Windows 10 upgrades free to users of more recent Windows* OS environments (7, 8.x), IDC survey data indicates that many businesses will upgrade part of their estate to this new OS within the next year. Without access to the modern hardware on which Windows 10 was built to run, however, many of the key features of the OS will fail to deliver their full benefits. The new capabilities of Windows 10 — such as biometric authentication, universal application deployment, and a seamless app experience — demand the capabilities of a new generation of hardware to properly enable and support them. By its very nature, this needs to be across desktop PCs, notebook PCs, and tablets, as well as future support for smartphones as they become embedded in business processes. With the move to Windows 10, organizations have a chance to rethink and upgrade the client computing hardware base to support the benefits of moving to a new OS environment.